The image was taken in a place near Slavonice, Southern Bohemia. It is said that it used to be a graveyard for hunting dogs of local noblemen. There is no specific info on the carved face and no dating exists. The place is part of so called Grasel paths – forest paths mapping various hideaways of one of the region’s most famous bandits called Grasel – a name that is commonly used in Czech language as an offence to someone who misbehaves. A similar work is part of her solo exhibition A Snake That Disappeared Through a Hole in the Wall, that is on display at Foam 3h from April 6th until the 24th of June 2018. According to an old Slavic legend, a snake inhabits people’s homes and brings happiness and prosperity to the household. This ‘snake housekeeper’ was traditionally welcomed with a bowl of milk on the threshold. 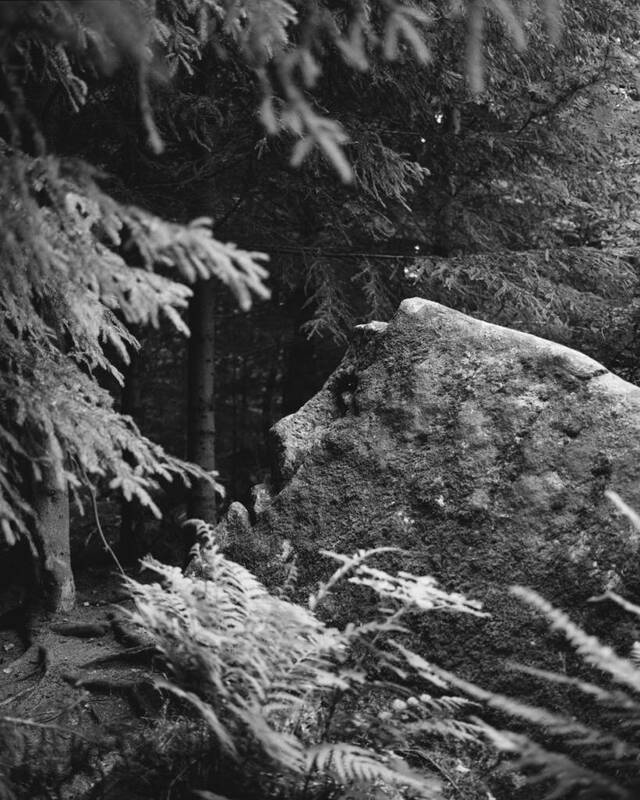 The story is one of the many folk tales from the Czech Republic which Tereza Zelenkova (1985, CZ) seeks to revive. Over the course of two years, the artist accumulated numerous stories that formed the starting point for extensive journeys through the landscape of her childhood. Tereza Zelenkova (1985, CZ) attained her MA in Photography at the Royal College of Art in London in 2012, and her BA in Photographic Arts at the University of Westminster in 2010. Her work featured in group exhibitions in London’s Whitechapel Gallery (2017), in Le Bal in Paris (2015) and Musée de l’Élysée in Lausanne (2015). Her work has been included in the collections of Saatchi Gallery in London, Museum Winterthur in Switzerland and the V&A in London. She has published three books: Supreme Vice (2011), Index of Time (2012) and The Absence of Myth (2013). Zelenkova lives and works in London.